Drivers searching for a small, sporty and affordable new car should see the 2018 Chevrolet Sonic. Available in hatchback and sedan body styles, the 2018 Sonic from Chevrolet boasts sleek, urban-inspired styling that complements its city-sized dimensions. This sporty small car may be low-priced, but inside and out, it offers features that modern drivers crave. 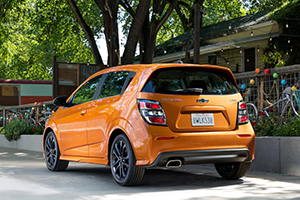 All Star Chevrolet invites car buyers near Denham Springs and Gonzales, LA to shop our website or on-site at our dealership to discover what makes the 2018 Chevrolet Sonic a standout in the subcompact car class! Read more below, then contact or visit us to get inside the sporty 2018 Sonic of your choice for a test drive! 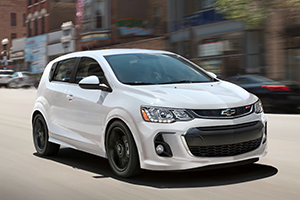 Thanks to the available 1.4-liter turbocharged 4-cylinder engine in the 2018 Chevrolet Sonic, this sporty small car delivers not only the impressive fuel economy you would expect from a subcompact, but also plenty of that fun-to-drive feeling! With your choice of an automatic transmission or manual gearbox, you can enjoy putting this agile car through its paces while enjoying smooth acceleration and stellar fuel efficiency. 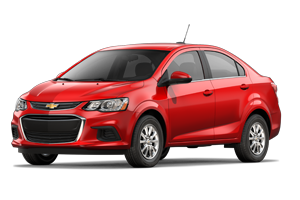 The 2018 Chevrolet Sonic sedan and hatchback models may be small, but Chevrolet has built them with loads of advanced safety features to protect you and your passengers. Starting out with ten airbags and a high-strength steel safety cage, the 2018 Sonic provides generous passive safety systems. Plus, the standard rear vision camera makes backing out of tricky spaces safer and easier! Advanced driver-assist systems like the available Forward Collision Alert and Lane Departure Warning add another level of safety and alertness, as does the optional Rear Park Assist, which adds sensors to the complement the standard rearview camera. The 2018 Sonic's lightweight and agile nature only aid in the safety of this small car, by providing an easily maneuverable car that allows you to react quickly to changing traffic conditions ahead of you. With both hatchback and sedan body styles offered in multiple trim levels and a range of colors and interior treatments, the 2018 Chevrolet Sonic is big on self-expression. The 2018 Sonic hatchback boasts a cavernous 47.7 cubic feet of maximum cargo capacity, thanks to its 60/40 split-folding rear seats and roomy hatch design. If you prefer the Sonic sedan, then you can still take advantage of nearly 15 cubic feet of cargo space in its trunk, which exceeds many compact sedans! 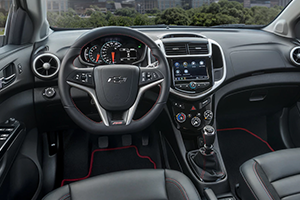 Tour and test drive the stylish and highly affordable 2018 Chevrolet Sonic hatchback or sedan at All Star Chevrolet. Our Baton Rouge, Louisiana Chevrolet dealership and service center are just minutes from Gonzales and Denham Springs, LA, so visit us at your convenience, and get pre-approved for financing online now!